It’s the modern-day bed of nails and you’ve probably seen them before. 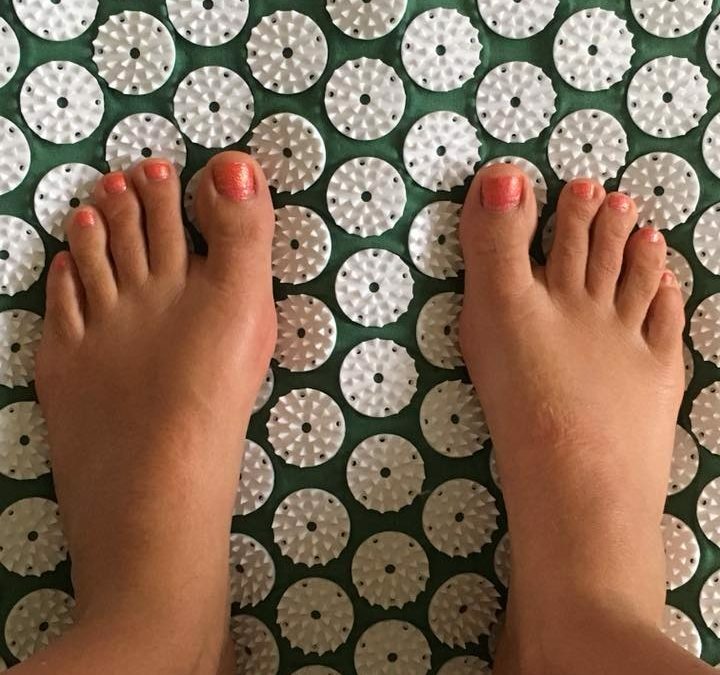 Acupressure mats or reflexology mats are increasing in popularity and have a multitude of benefits. The most well-known brand is the Shakti Mat but there’s dozens of others out there that are just as good. Based on principles of acupressure and used for meditation and self-healing and used for thousands of years in Asia, while the spiky bits may look painful, the reality is your body weight is distributed evenly across the 6000 odd spikes, easing tension, inducing a state of relaxation and stimulating your body’s own healing system. As an affordable, transportable option for well-being, there’s really no reason not to have one. Back Place your acupressure mat either on the floor or on your bed then lie down on it, face up focusing on long slow deep breaths. Soft surfaces make it easier to use, especially at the start. You can stay here for as long as you like, starting with a few minutes and working your way up to encourage your relaxation response. Feet Our feet are covered in sensory receptors and if you spend all your time in shoes, they may not be used to being stimulated so with this one start easy – in socks or just placing your feet on the mat while sitting down before progressing to standing on the mat. This will help stimulate circulation and sensation in the feet as well as provide a massage to tired, achy feet. Neck and shoulders Roll up a towel and place it under the top part of your mat then lie down face up with the raised area under your neck/shoulder area, either on the floor or on your bed to release tension from poor posture or excessive time working at a desk. Again, start with short periods of time and work your way up. Niggly areas – I regularly slowly roll my shoulders on my mat – they are always a bit niggly – not injured as such but tight. I find a few minutes of rolling from side to side eases that tension very effectively. Bed of nails, not quite – but very beneficial.